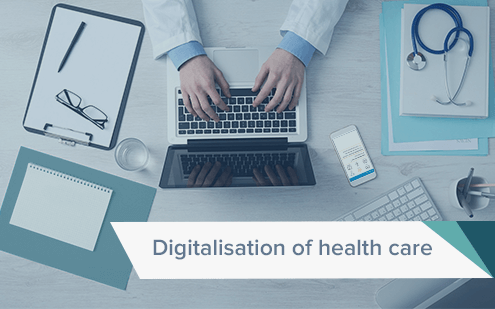 Did you know that proMX develops digital health care solutions? Besides being a digitization partner for businesses, we have been contributing our expertise in customer relationship management and Microsoft technology to e-health projects for more than ten years. From 9-11 April, we will present the online platforms we have developed for use in medical movement therapy at DMEA, Europe’s leading health IT event, in Berlin. Our main competence as a business lies in customer relationship management with Microsoft Dynamics 365. We support organizations in their digital transformation by helping them find and implement the right solution, integrating it with other systems, customizing it according to individual requirements and providing technical support. We have earned a reputation as one of the leading partner companies in this field. In fact, in 2015 and 2016 we were selected as a member of Microsoft’s “Inner Circle for Dynamics”. Only 60 of the approximately 7,000 Dynamics Partners worldwide belong to this elite group. Our e-health platforms are also based on Dynamics 365. We customize the CRM system, which usually depicts customer relations and automates sales processes, for use in movement therapy according to the logic of xRM, otherwise known as Any-Relationship-Management. This way we turn entities such as Customers into Patients, and Contracts into Training Plans. “MS bewegt!”: This cooperation between multiple sclerosis patient organisation AMSEL and health care provider Techniker Krankenkasse aims to promote activity among people with multiple sclerosis. Patients access personal training plans via a smartphone or smartwatch app. Therapists, in turn, follow patients’ progress on an e-health platform and adjust plans according to the feedback received. „RückenWind“: We have developed an internet based training for Siemens health care fund (Siemens-Betriebskrankenkasse) specifically to treat chronic backache. „Meditrain“: We have also customized an online platform for Erlangen, Germany based health, sports and physio therapy center, Meditrain. It allows people to access their individual therapy program both when working out at the center and when they do e-training from home. At the Microsoft booth at DMEA (Hall 1.2, booth B-104) we will explain how these solutions work and what other areas of deployment are possible. Make a mental note to visit us or make an appointment for a chat with our experts in advance.